What Makes a Smoothie Unhealthy? Hemp seeds are a potent superfood worth incorporating into your smoothies and diet. 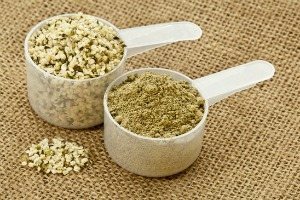 I don’t consume as much hemp as I did during my vegan days, but do still enjoy hemp seeds in my smoothies and sprinkled on salads and other dishes from time to time. Hemp is a complete protein that contains a balanced ratio of the essential fatty acids omega-3 and omega-6. Hemp also contains many B vitamins, vitamins A, D and E, iron, sodium, calcium and is a good source of dietary fiber. This fabulous nutrient profile leads to the following health benefits. Healthy Heart: the essential fatty acids can help reduce inflammation, improve circulation, and reduce blood cholesterol to prevent plaque buildup in the arteries. Better Digestion: hemp seeds are easy to digest and the fiber they contain aid proper and healthy digestion. Weight Loss: a natural appetite suppressant, you’ll feel full longer and have less cravings for unhealthy foods. Increased Energy: as is the case with most superfoods, expect to feel an increase in energy. Brain Health: the omega-3 and omega-6 fatty acids help keep your brain healthy. Immunity Boost: supports a healthy immune system. For smoothies, make sure to use shelled hemp seeds or a hemp protein powder. Hemp seeds are mild with a slight nutty flavor. Besides smoothies, they are also good sprinkled on salads, yogurt, and in homemade trail mixes. Other good hemp products include hemp oil, which you can use in salads as an alternative to olive oil. Hemp milk, which is a great for vegans who get sick of almond and coconut milk, or just want to switch it up. And hemp butter, which can be used like peanut butter. Hemp is indeed a very nutritious and versatile superfood, which when combined with the other ingredients below results in a superfood smoothie! Enjoy! Place all of the ingredients into your high-speed blender and blend for around 30-45 seconds or until nice and smooth. I’d love to know if you tried this blueberry hemp smoothie – please do tell in the comments below. Happy Blending! It’s about time this blueberry hemp smoothie got some love :) Spirulina is a beautiful add-on, Savannah. Thanks leaving a comment. Blendtec's Certified Refurbished Total Blender with WildSide jar is currently $179.95. That's $100 off the regular price! Click here to take advantage of this phenomenal offer. Enter your name and email below to get Free Instant Access to my 15 Simple Healthy Smoothie Recipes e-book. Top 10 Superfoods for the Healthiest Smoothies Ever! What is Maca and why should I put it in my Smoothie? What is Cacao and why is it perfect for Smoothies? Why Butter is a True Superfood!